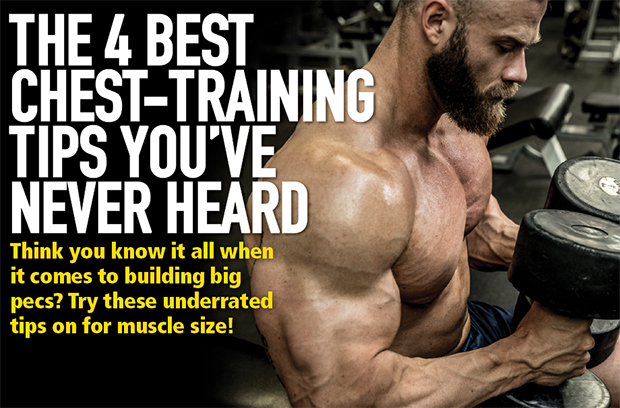 The 4 Best Chest-Training Tips Youve Never Heard! Think you know it all when it comes to building big pecs? Try these underrated tips on for muscle size! A beginner’s approach to chest training is as simple as flat bench, incline, and decline barbell presses. Problem is, that practice will take you only so far. Every intermediate and advanced lifter will tell you that to continue making gains, you need to really mix up things up. Some bodybuilders call this the principle of muscle confusion, a practice of providing differing types of stimulus on the muscle fibres. And that can mean anything from mild to wild. What are a handful of smart strategies to continue making pec gains in both size and strength? Here are four that rank near the top in my book. 1. Front-load your chest workout with a strength emphasis. Often, you’ll see workouts listed as 3 sets of 10. Nothing tells a muscle to yawn more than always using the same relative intensity (that is, the load in which you reach muscle failure is always the same rep target: 10). Always doing 10-rep sets is one major ingredient toward stagnation. In fact, to maximize muscle building, you want to be using the entire rep range of 6 to 12. This means you’ll use a varietyof relative intensities in your training. For our purposes, that means if you’re always doing 205 pounds for sets of 10 on the bench press as the first exercise in your workout, you’re leaving gains on the table! Try this: Put 10 pounds on each side of the bar—you have 225 now. While you won’t reach 10 reps, you may get 6 or 7, maybe even 8. What’s important is that this stimulus is newon the muscle. And you can add another dime on each side—now it’s 245—and maybe you’ll get 4 or 5. And of course that stimulus is one even better geared for strength gains! Over the long run, this kind of change can lead to more significant results. On your first exercise then, when your energy levels are highest, let’s challenge you with lower rep targets than you may have been using previously. Choose weights with which you can do no more than 6 to 8 reps, and don’t be afraid of going even heavier for sets of 4 to 6 when you have a spotter available. Generally speaking, a rep target of 6 to 8 is equal to 80 to 85 percent of your single-rep max, so if you know your 1RM, you can simply multiply it by those percentages to estimate what the load range should be. If your best single is 255, the load range for 6 to 8 reps is 205 to 215 pounds. For 4 to 6 reps, use 85 to 90 percent of your best single, which in this case would be 215 to 230 pounds. Of note, the heavier loads have a more significant impact on what’s called mechanical tension, which affects the integrity of skeletal muscle cells and is thought to have the most influence on subsequent muscle growth.1Again, because your energy levels are highest early in your workout before fatigue sets in, this works best with your very first exercise. 2. Include more than three bench angles. Every bodybuilder works the pecs from the three major bench angles because those effectively target (though not isolate!) the upper, middle, and lower regions of the chest. But which bodybuilding god deemed that there were only three such angles? The fact is, there are plenty of intermediate bench angles between those common ones that are just ripe for the pickin’. Have you ever tried a bench angle halfway between flat and upper, or one between flat and lower? These in-between angles represent new opportunities for muscle growth that are just different enough from the staples you’ve already been using. You won’t find these less-common bench angles on the various bench-press racks though; you’ll have to go to the adjustable benches. Here you’ll find all kinds of ‘tweeners that can be used with dumbbell training, or roll one over to the Smith machine or power (or even squat) rack for some barbell training. Heck, you can even do your single-joint cable and dumbbell flyes with in-between angles, too. 3. Focus on the liftoff and lockout portions of benches. Here’s a page right out of the powerlifter’s playbook, and you’d be crazy not to study what works for the world’s strongest athletes. Here, you’re going to use techniques to build strength at specific points in the bench press’ range of motion. One especially effective method iscalled paused bench presses (aka dead benches). Understanding it requires a basic understanding of physics (really), but here’s a quick summary. As you lower a bar, elastic energy (aka potential energy) builds up in the muscle (sort of like when a spring is compressed), which assists you when you smoothly reverse direction and begin the push. What we want to do, then, is eliminatethat assist. So if you insert safety bars at the lower end of the range of motion in a power rack and allow the bar to briefly settle on the bars—continue to stay tight—that built-up energy is lost. You’ve now made the movement harder, and your short-term training strategy now targets building up your strength over that area. Outside of the power rack, simply hold the bar for about two seconds just off your chest. You can also overload the top portion of the range of motion, even if it’s well above your sticking point. By using partial reps (or lockouts)—that is, setting the safety bars to limit the ROM to the top half or third—you can effectively increase the load over what you’d normally use. You can also use bench-press boards to achieve this effect. So, for example, if you can do 225 pounds for 7 reps but get stuck on the eighth at the bottom of the ROM, instead work over just the top half in which you’re already stronger. Load this area up with even more weight so you can increase your strength along this partial arc. Your nervous system will also learn to adjust to handle heavier loads than it’s used to. One underutilized technique I’m sure you’ve seen is the use of chains or bands on both sides of the barbell. With these, the resistance increases the more your arms are extended (the farther the bar is from the floor). Hence, the weight is actually lighter at the liftoff and heavier toward full arm extension, which actually closely mimics most individuals’ strength curves for the bench press. This utilizes what’s called variable resistance; you’re pushing less weight where you're weakest and more weight where you're strongest. 4. Focus on building triceps’ strength. One reason the bench press and its many variations are so effective at building pec size and strength is that they’re multi-joint movements, which is pretty obvious. What may not be, however, is that relatively weaker triceps or front delt strength may be holding back your chest development. If one of those muscles reaches failure before your pecs do, a set must necessarily come to an end. Over the course of many workouts, that amounts to a heckuva lot of chest gains you’re not accruing. Dedicated triceps work should therefore aim at strengthening your arms rather than just pumping them up so you look good. Take a more aggressive approach to arm work, then, including a heavier reliance on multi-joint exercises (weighted dips, machine dips, weighted bench dips, and close-grip bench presses) and doing those sets similar to what you did in point 1: focusing them more on strength by lowering your rep targets. What’s more, you can even apply some of those liftoff and lockout techniques on close-grip bench presses, weighted dips, and the like. You might also want to adjust your training split in the short term so the triceps are targeted at the beginning of a workout (say you do them with biceps) or do them on their own day altogether. Training them after chest or shoulders all the time means they’re already partially fatigued by the time you get around doing dedicated movements for them. A nice side benefit, of course, is that over time you’ll be able to handle more weight on those triceps exercises, meaning that you’re boosting potential for some serious arm growth at the same time. 1 Vandenburgh HH. Motion into mass: how does tension stimulate muscle growth? Med Sci Sports Exerc. 1987 Oct;19(5 Suppl):S142-9.